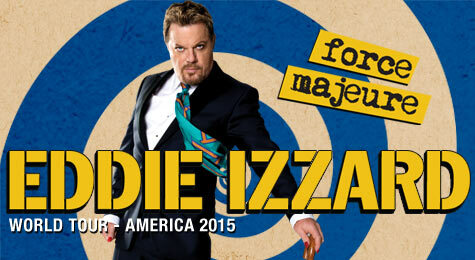 Eddie Izzard’s show is hysterical and historical. “Force Majeure,” gets a lot of laughs at the expense of the Religious and the Nazis. When it comes to religion, Eddie Izzard is not as bad as many in the popular media. He’s not nearly as bitter so there’s more comedy than mockery. He also distinguishes between different types of religious people: the ones that do charity and the ones that are ignorant bigots. Izzard’s understanding of history is quite clear: in spite of some setbacks here and there, we are moving upward and that is the important thing. One of the major setbacks was the Nazis, but they were merely an interruption in the upward trend. In the Q&A after the show, a fan asked Eddie if he’d be changing any of his Nazi material when he toured Germany in the coming year. He said that this wouldn’t be necessary. He believes that the German people are like us and that Hitler kidnapped Germany for 12 years. Once the Nazis were removed the German people could get back onto that upward trajectory. This interpretation of history is very popular–it is the modern story. Mankind is basically good and freedom is the goal of history. Over the last 500 years we have been gaining freedom–first from the Church, then from the monarch, then slavery, then God. In the 20th century, freedom spread through the civil rights movement and women’s liberation and it continues through all sorts of sexual freedoms. For many, this optimistic view of history has filled the gap created by the loss of religion. There is an almost supernatural faith in humanity to achieve its utopian ideals. Like all supernatural faiths, this one too offers a type of salvation. One of the problems with Izzard’s view is that it divides people into them and us. The “them” is the religious bigots or the conservative. The “us” is progressive and open-minded. It is the latter group that is responsible for the upward trend in history, and the former group that is largely impeding our progress. I don’t fault Eddie. We are all guilty of “them=bad/us=good” thinking now and again (all the time?). The line that divides good and evil is not between people but within people. There aren’t good religious people (Izzard’s charitable Christians) and bad religious people (opponents to freedoms sought by the LGTB)–they are all bad. Christians aren’t less evil than Muslims–news out of Central African Republic is evidence of this. Atheists have to accept Stalin and Hitler as theirs, and Christians have to accept the Spanish Inquisition and the Crusades as things that Christians did. Because the human soul is divided, human flourishing will not inevitably increase over time. The 20th century alone provides ample evidence of exactly this–incredible medical and technological advances, on the one hand, two devastating world wars on the other. The United Nations was born and so was the Atomic Bomb. The Olympics and the Holocaust. Civil rights and Abortion. The music of the 60’s and the music of the ’80s. Humans are capable of tremendous good, so we may again have another Mandela, but unless we recognize that the true impediment to human flourishing is the evil that lurks in every human soul, we will again face evils as great as any we’ve encountered in human history. The solution to our plight is not for everyone to become a progressive liberal. It’s to deal with the evil that exists within all humanity.